This is file art. But it remains evidence of an industry in trouble. The private sanitation industry’s terrible traffic safety record on NYC streets is getting even worse, according to a new report from the labor/environmental coalition Transform Don’t Trash NYC [PDF]. The number of crashes in the city involving the 20 largest private trash truck operators nearly doubled in the two-year period ending February 28 compared to the previous two-year period. More people are losing their lives in these collisions too. Drivers with these 20 private carters have been involved in 67 traffic crashes since March 2016, including five fatalities, according to data from U.S. Department of Transportation. That’s up from 35 crashes and two fatalities in the two-year period beginning March 2014. The increase in crashes underlines the urgency of enacting reforms to cut down on excessive trash truck mileage and make the industry safer for workers and the public at large, advocates say. Private carting companies collect commercial waste — not the residential and municipal trash collected by the city Department of Sanitation. Contracts are negotiated one client at a time, and clients tend to be spread across the city, leading to long, exhausting routes. 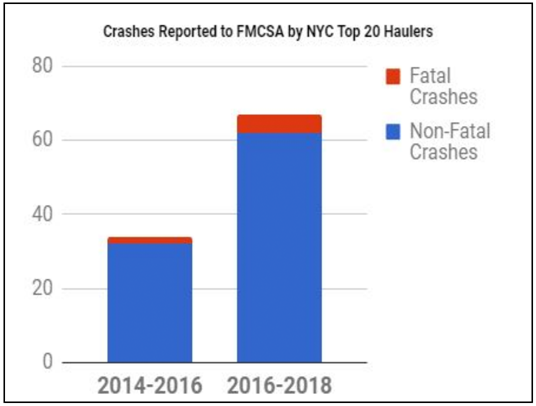 The results are deadly: Drivers for commercial trash carting companies have killed at least 43 people on NYC streets since 2010, according to city data. Sanitation department drivers, on the other hand, have not been involved in a fatal crash since 2014. The Transform Don’t Trash coalition wants the city to switch to a “zone-based” system where companies compete for all the business within specified geographic areas, and to make companies’ safety records a high priority when selecting bids to haul trash for each zone. In 2016, the de Blasio administration announced its intent to institute zone-based waste collection along the lines recommended by the coalition. The reforms could reduce private carting mileage by 49 to 68 percent, cutting greenhouse emissions, improving working conditions, and preventing injuries and fatalities in the process. City Hall is expected to release a detailed implementation plan sometime this year. These changes are running into significant opposition from the private carting industry, and advocates want to make sure the city sticks to its plans. The recent increase in crashes and fatalities involving private carters fortifies what was already a strong case. 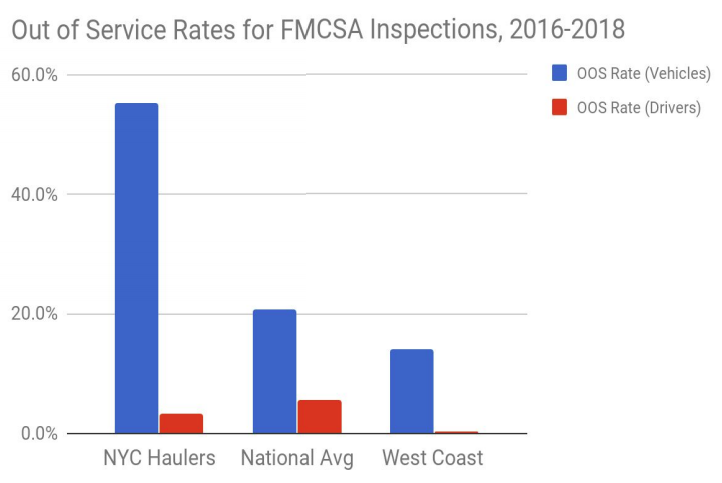 The number of crashes per driver in NYC’s commercial carting industry is now three times higher than in Los Angeles, San Francisco, and Seattle, cities that have already enacted versions of zone-based contracting. New York’s private hauling industry also performs significantly worse than average on vehicle safety. From March 2016 through February 2018, 55 percent of vehicles belonging to the 20 largest carters that were inspected were taken out of service for violations like faulty brakes or lights — more than double the national average. I know we like to call out retroactive pension increases and sweetheart union contracts around here…. But if ever there were an argument for unionized workers, with job protection and decent work rules over unfettered capitalism and the desperate workforce it inherently creates, its in the two sentences above. Overworked contractors with zero protection from their exploitative employers? It’s a lot of factors besides a unionized work force. You can just as easily substitute a well-treated ununionized work force. The key here is you don’t exploit your workers. It’s easier to enforce that when NYC is the employer instead of a private company, regardless of whether or not a union exists. A second major factor, perhaps even more important, are the vehicles themselves. DSNY uses only cabovers. That should be the rule for both private and public sanitation trucks. The superior visibility of cabovers doubtless is a big factor is reducing carnage. Another factor might be that DSNY trucks are underpowered compared to those used by private carters. They’re snappy off the line (and that’s needed for routes with frequent stops) thanks to low gearing but above 15 or 20 mph they just gather speed. That makes it difficult to reach dangerous speeds. You just don’t see DSNY trucks barreling along at 50+ mph on major arterials like the private carters. In fact, I can usually keep up with DSNY trucks on my bike. There’s a great case to be made for having DSNY serve business customers. Businesses in this city pay heavy taxes. I’ve never understood why we expect them to also pay for their garbage pickup. That should be included in the taxes they pay. What is the point of these private carriers? It seems logical that the entire thing should be turned over to Sanitation. its an obvious case for “citicization” – that’s my term for nationalization when a city takes over less efficient and frankly, deadly private enterprise. the basic inefficiency of independently negotiating 10s of thousands of contracts among dozens of contractors, duplicating each others’ routes almost entirely is the problem. Like roads, schools and air traffic control, NYC sanitation – simply is more efficient if publicly operated. Add water/sewer, health care, and mass transit to that list. I can’t see any scenario where private enterprise would do any better. Totally agree. Despite how the right wing may think private enterprise is always more efficient, in truth it isn’t when you’re talking essential goods and services. Private enterprise seeks to do one thing, namely maximize profits. It certainly doesn’t use resources more efficiently, nor does it care one iota if people are killed while making a buck. You might even make a good case for the government largely taking over food production, health care, and non-luxury housing. Whenever a private company makes a profit on something, that implies the end user paid more than it actually cost to make the good or service. That’s fine for optional things but not necessities. I’m generally a free market person but even I realize the folly of a bunch of companies competing to deliver essential goods or services. Some things should just be charged at cost to the end user and done by government. AirFlow Deflector recently participated in a NYC BIC and Swana hosted event where new and innovated technology was introduced to the private companies. This included front, side and rear sensor crash avoidance sensors, truck side guards, driver training and analytics, and other safety devices that all help to reduce or prevent accidents on our streets. Both preventative and last-resort technology is being introduced into the market – all of which will help raise awareness and to educate both the vulnerable road users and drivers of all vehicles of the potential dangers. Dialogue is in play and all industries are adopting technologies mentioned above as part of Vision Zero initiatives.